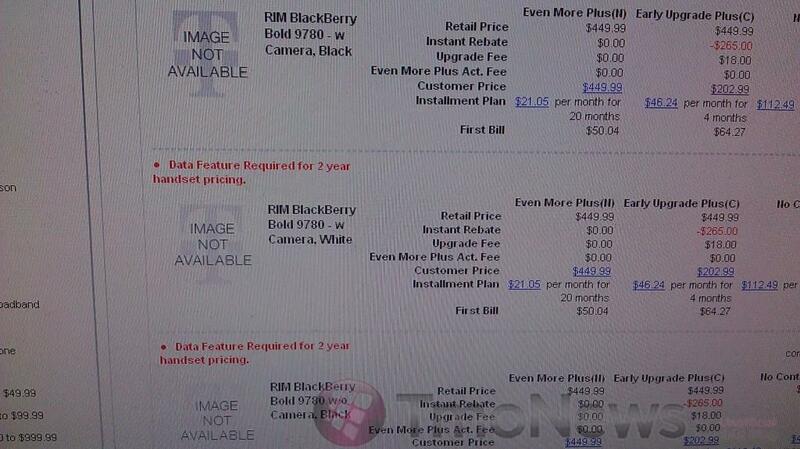 In addition to offering two color options for the BlackBerry Bold 9780, it looks like T-Mobile will be offering two versions of the handset as well. According to the image above, it seems Magenta will sell a “camera-less” version of the 9780 in addition to the regular version. The Bold 9780 without a camera is perfect for business and government subscribers who are not permitted to have a camera phone at work. As stated previously, expect both versions to launch November 17th for $129.99 with a 2-year agreement and $449.99 sans contract. Good for anyone who works in an area that requires a security clearance. Nice hopefully they can pull some corporate contractsp ! Probably so because there are a bunch of people who read this site, and I’m sure more than 50 carry a different stance on this product than you do. Seems T-Mobile has become like the other 3. Before they did not offer the w/o camera blackberry but basically everyone else did. Look up T-Mobile’s 8800 and 8820. So… lemme get this straight. The latest and greatest from RIM is a Blackberry WITHOUT a camera. I’m sorry, did I miss the punchline? Apparently you missed a lot. There are many sectors of the business world in which a phone with a camera can not be taken into a place of business, due to concerns of proprietary information being photographed and leaked. See how much info on this site alone is the result of someone using a cellphone camera to document a leak, and this is relatively trivial crap. Now imagine multi-billion dollar companies and their need to keep in-house secrets safe, especially products in R&D. Thus, offering a BB without a camera means T-mo can offer businesses the tool they need, a product they can use within their own company and/or while visiting suppliers and business partners. No need for snarky comments. It only points out what you don’t know. There is a camera version available as well. As stated in the article, some jobs do not allow employees to have camera phones. My employer locks down the camera on our corporate Blackberries anyway, so a cameraless version would be perfect for them. As our IT manager likes to constantly remind us, the devices are for “work related” purposes only, and “don’t do anything on there you would not want published in the newspaper with your name and picture next to”. Personally if I was going to spend $449 for a phone off contract I would get the new mytouch 4G. The price is way to high for a blackberry without a camera. i guess its cool for company use but hey what do i know im just some dude. Thank you from a government worker who is tired of crappy phones! Now I can get into the current age and still use a phone in my high-security area!